Artist's impression of NASA's IBEX spacecraft studying the edge of our solar system. Scientists will announce new findings about material from beyond the solar system at a NASA press conference today (Jan. 31). The researchers will also discuss discoveries about the boundary region that separates our solar system from interstellar space and protects us from fast-moving particles called galactic cosmic rays, researchers said. Seth Redfield, assistant professor at Wesleyan University in Middletown, Conn.
NASA launched the coffee-table-sized IBEX probe in October 2008 to map out the boundary between the solar system and interstellar space. The $169 million spacecraft was built for an initial two-year mission. So far, IBEX has made some surprising discoveries. 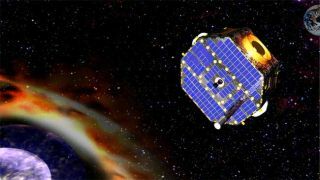 In 2009, for example, the spacecraft detected a mysterious ribbon on the edge of the solar system that scientists now think is a reflection of the solar wind — the million-miles-per-hour stream of charged particles from the sun. And in 2010, researchers announced that IBEX had gotten the first-ever look at the solar wind crashing headlong into Earth's magnetosphere.